As the third Mercury 7 astronaut, John Glenn (b. 1921) became the first American to orbit the Earth on February 20, 1962. On February 23, he returned to Patrick Air Force Base (Patrick AFB), accompanied by Vice President Lyndon B. Johnson (1908-1973), and was reunited with his wife Annie Glenn (b. 1920) and their children. Glenn, his wife, and Vice President Johnson then motorcaded to Cape Canaveral and participated in a parade through Cocoa Beach, Florida. Upon arrival at the Cape Canaveral Air Force Station (Cape Cananveral AFS), they greeted President John F. Kennedy (1917-1963), who had flown into Cape Canaveral, landing at the Skid Strip. From there, President Kennedy and Glenn were driven to Hangar S at Cape Canaveral, where the President presented him the National Aeronautics and Space Administration (NASA) Distinguished Service Medal. They then toured Mercury Control Center and then greeted launch workers at Launch Complex 14 (LC-14). 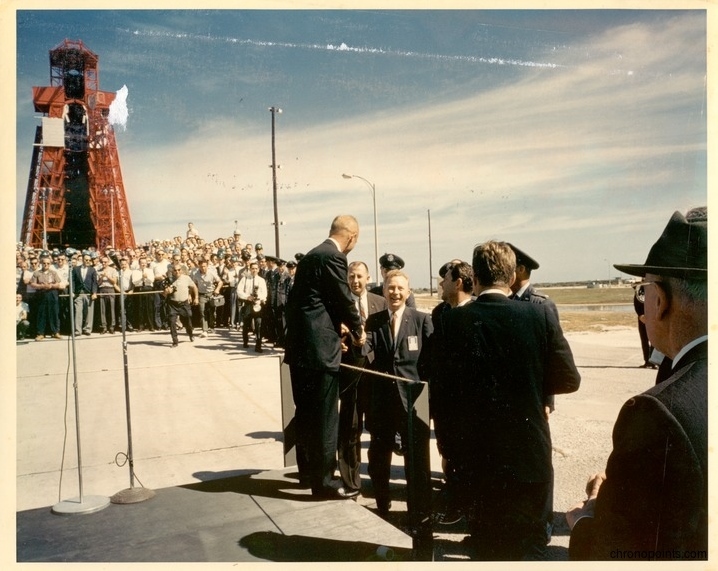 At the launch site, Glenn presented the President with a hard hat that workers wore when at the launchpad. Original color photographic print, February 23, 1962: Private Collection of Dr. Calvin D. Fowler. Digital reproduction of original color photographic print, February 23, 1962. 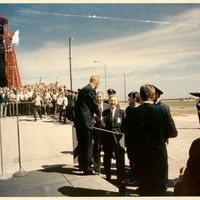 “John Glenn Returning to Cape Canaveral Air Force Station Launch Complex 14 After Mercury 7 Flight.” RICHES of Central Florida accessed April 22, 2019, https://richesmi.cah.ucf.edu/omeka/items/show/4972.